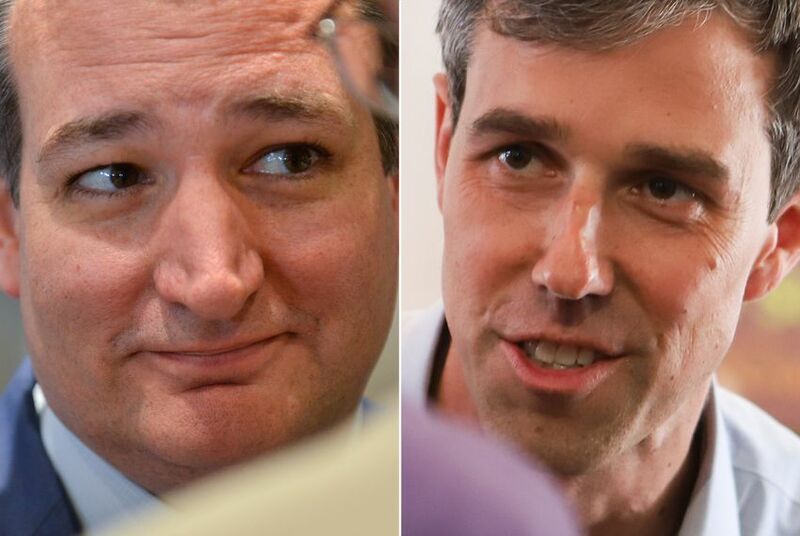 Hopeful Democrats are talking about whether Texas or the rest of the country is in for a blue wave in this year's elections. They should be looking for purple splotches in what has been a very red state for more than two decades. In politics, purple is often the first sign that a state or a district is swinging from one party to the other — from blue to red, or red to blue. Perhaps — and there’s not really a way to know for sure until November 6 — Texas is still a red, red Republican state. It is certainly not a blue state. But one way to explain all these weird polls and other political soundings is to say this red state is developing some purple splotches. How else would you have a close Senate race and a blowout in the race for governor? Assuming almost every poll is right, that’s the situation with, on one hand, Ted Cruz and Beto O’Rourke, and, on the other hand, Greg Abbott and Lupe Valdez. Three or four contests for Congress find Republican incumbents in electoral danger in districts that were drawn for them. Two or three state senators are in the same shape. Pundits are already preparing political obits for Republican state representatives in Dallas County, which has already shifted from red to purple to a reasonably convincing shade of Democratic blue. What about the races in the middle? Less polling has been done in the down-ballot statewide contests for lieutenant governor, attorney general, comptroller, land commissioner, agriculture commissioner, railroad commissioner and for spots on the Texas Supreme Court and the Texas Court of Criminal Appeals. In any election in Texas since 1994, every single winner of those offices was chosen, for all practical purposes, in the Republican primary. It didn’t matter a whole lot whether the Democrats had money or not — winning the GOP primary was tantamount to election. Primaries have been knife fights; general elections have been formalities. Here’s the thing, though: Before this was a red state, it was a blue state — with purple splotches. U.S. Sen. John Tower and Gov. Bill Clements busted through long before any other Republicans, but they were exceptions. Scandals (and a lot of business money) began knocking Democrats off of the Texas Supreme Court. Phil Gramm was a Democrat in Congress before he switched parties and won a U.S. Senate seat. Democrats remained dominant. Kay Bailey Hutchison, running for state treasurer, and Rick Perry, another party-switcher running for agriculture commissioner, broke through in 1990 as Republicans, when Democrats were winning everything but Gramm’s seat and the courts. Hutchison won a special election for U.S. Senate. Then George W. Bush beat Ann Richards in a year when the Democrats were still winning most of the statewide, congressional and legislative races. But the purple was seeping: Democrat Martha Whitehead won the treasury seat, but by fewer than 25,000 out of 4.1 million votes. Railroad Commissioner Jim Nugent, a Democrat, was nudged aside by Republican Charles Matthews — by fewer than 70,000 votes. The Republicans haven’t lost a statewide race since then, but some of those early victories were nail-biters. Bush won by 37 percentage points in 1998, but in the next race on the ballot, Perry beat Democrat John Sharp in 1998 by fewer than 2 percentage points. The race for comptroller was even closer: Republican Carole Keeton Rylander had 49.55 percent to Democrat Paul Hobby’s 49 percent. It looks red now, but it looked like a slightly red swing state then. As a full ticket, Republicans have won consistently ever since, most of them by comfortable margins. This year, with Democratic excitement about the U.S. Senate race peaking and Republican anxieties about that same contest rising, it’s not hard to find hopeful talk of a blue wave. Republicans have had some hard knocks elsewhere in the country. It’s a Republican president’s first mid-term, spurring speculation about Donald Trump’s effect on Republican chances. Now the tumultuous Supreme Court appointment of Brett Kavanaugh is adding to the uncertainty. And there are those polls, consistently showing a single-digit race for U.S. Senate and a double-digit race for governor. Most polls don’t include the other statewide contests below those, leaving the rest of those statewide officials wondering which coattails they can count on. The challengers are having a hard time getting attention — nothing unusual there — and the incumbents are, for all of their headlines and pronouncements, not well known by voters who don’t eat and drink politics for breakfast, lunch and dinner. Party flags mean a lot in races like those; just ask your friendly neighborhood judge. If — it’s still an “if” — the state is in for another plague of purple splotches and a run as a swing state, theirs are the races where you’ll see it most clearly in November.